July | 2012 | Crystal Water Villas Blog - Lake of the Ozarks! Every now and then we see stories about family vacations gone wrong. There have been instances when a vacation rental business appeared legitimate, but was nothing more than a scam. Always be sure to do you research to protect you and your family. 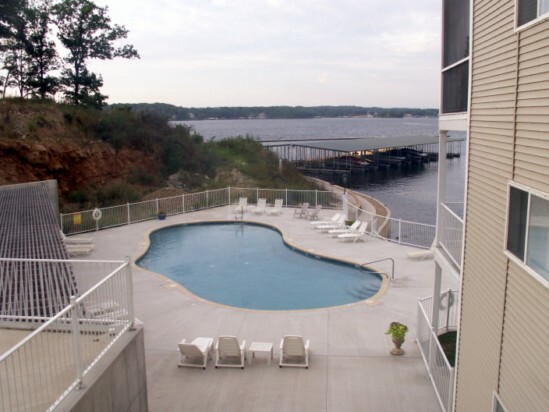 We work so hard day in and day out to provide the best stay possible at the Lake of the Ozarks. We do our diligent research and take on the best properties in the area. Since 2002, we have been dedicated to helping folks kick back, relax, and have an enjoyable vacation at the Lake. 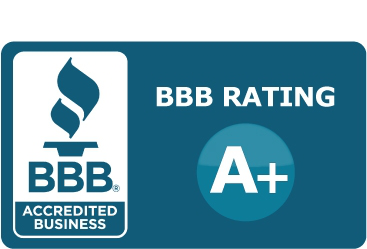 That’s why we are so proud to announce we have an A+ rating from the Better Business Bureau. Feel free to visit our review page here. Know that you are in safe hands when you book with Crystal Water Villas! You’ve probably heard of food and wine pairings or food and beer pairings. But we’ve got a series that pairs two of our properties together. If you’re planning a group trip to the Lake of the Ozarks or a family reunion, you’ll want to be close together. Each of these property pairings will sleep, at the least, 14 people. This week’s pairing features Chloe’s Cove and Blue Anchor Bay Condo. Chloe’s Cove is in the newly developed Millstone Condominium complex and, as you can see, has a gorgeous view of the lake. This condo sleeps 8 people, has three bedrooms, and two bathrooms. Oh, and you have easy access to the pool! Blue Anchor Bay condo also offers stunning views of the lake. This luxurious condo sleeps 6 people, has three bedrooms, and two bedrooms. Check out the rest of the photos from this fabulous condo. After a little hiatus, this fantastic and cozy property is back!! Be the first to book a stay at Simple Pleasures — a private home on a level lot with a nice yard and easy access to the Lake! Perfect for a small family! This wonderful private lake-front cabin resides in Soap Creek Cove which is on the Gravois Arm (5-mile marker). The property is ideal for small to medium sized family vacations. The home includes a great manicured yard, large deck and a nice private dock with boat slip and paddle boat. The cozy knotty pine interior cabin is packed with all the comforts of a lake front family oriented property: consists of a living area with a sofa sleeper (queen size) and seating for six, electric fireplace, 32 inch TV with Satellite service (movie channels access during the Summer), VCR, DVD, and stereo. This cabin offers guests all of life’s simple pleasures – a quiet place to enjoy the Lake’s beauty and a great location for kicking back and creating wonderful memories with family and friends. 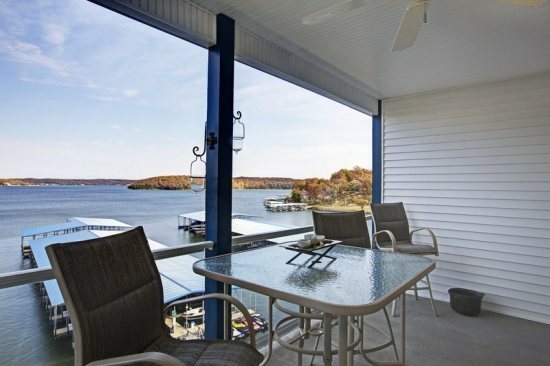 This cabin is just 35-40 minutes away from all the attractions on the west side of the Lake – Bagnell Dam, Lake Ozark, and Osage Beach – via the nearby community bridge. Click here to be the first to book your stay at Simple Pleasures!! This executive business, family, and/or wedding retreat sits on a private point (7-mile marker) overlooking the main channel and Gravois arm. The remodeled home is two stories, three bedrooms, and two baths. The main living area contains a living room with a gas log fireplace and sofa sleeper (full size), dining room, kitchen with breakfast bar, large family room, two bedrooms (1 queen and 1 full), full size bath with large shower, and deck with iron railings and outdoor furniture. The master suite resides on the lower level with a queen sleigh bed, twin sofa sleeper, full size bath with shower tub, and outdoor rock patio. This private family home comfortably sleeps 6-9. The 2,000 square foot vacation rental is available year around and features central heating/air, dish network TV, DVD, VCR, phone, ceiling fans, all bedding, dish towels and iron. The kitchen is fully furnished and includes a dishwasher, range, microwave, refrigerator, ice-maker. Other features include weekly trash pick-up, open parking, and laundry room facilities. 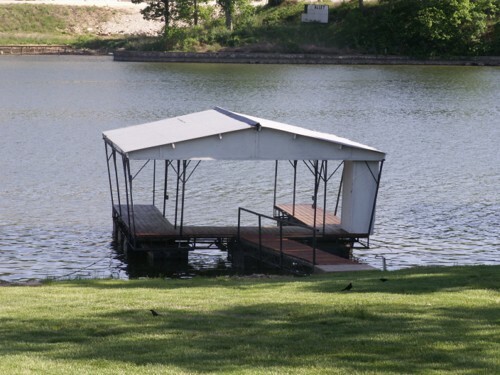 A covered boat slip (28’ or 24’) is available at nearby Millstone Lodge at $15.00 per day. Click here to book your stay!! We can never take for granted the men and women who serve our communities and our nation day in and day out. They are the ones who put their lives on the line, who serve with honor, and make sure that our neighborhoods are safe. They are the ones who come to the scene and perform tremendous acts of heroism. It’s important to recognize all of those who serve. That’s why we have a 10 percent discount for men and women who serve in the military, the National Guard, police officers, firefighters, educators, and nurses. It’s just a little way for us to say thank you for all that you do. When you book your stay, be sure to mention if you are one of the above. The Lake of the Ozarks In Your Pocket! 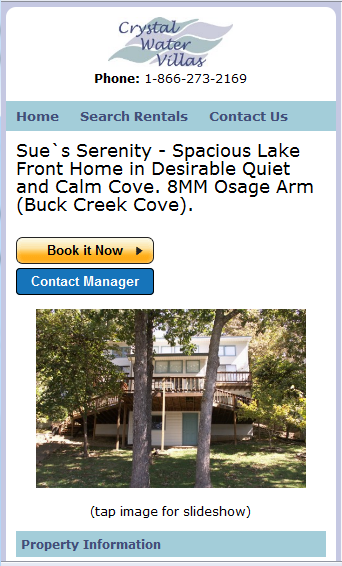 We are very excited to announce a new way to browse our properties and to book your trip to the Lake of the Ozarks! Our brand-new, mobile website is LIVE! Whether you’re waiting at the dentist’s office or wanting to show off a property to your spouse, you can access our full website from your mobile phone. All you need is the ability to browse the web. Even Book Your Stay right from your Mobile phone! You can access our mobile site by visting www.crystalwatervillas.com/m. It’s that easy! Also, the first three people to book via our mobile site will receive an automatic 10% discount! Here’s a preview of what you can expect on our new, mobile website. Take a look at the site and give us some feedback!